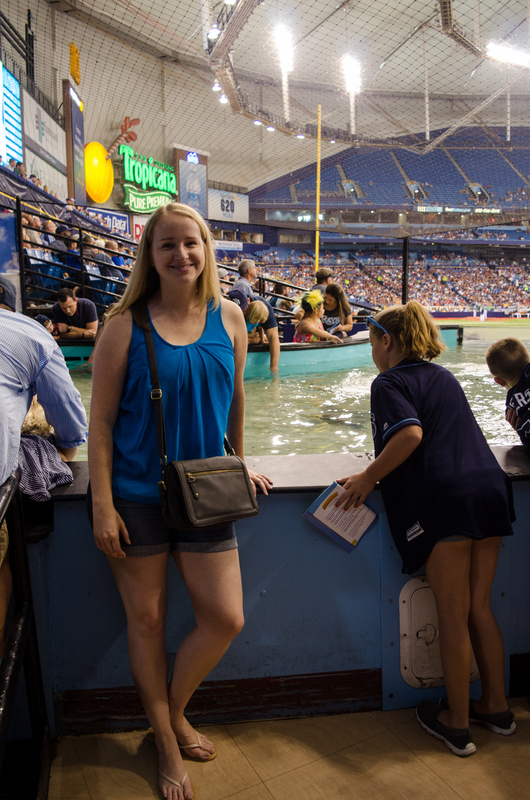 One thing that always get me excited is the possibility of visiting a new MLB stadium and my visit to Tropicana Field was no different. 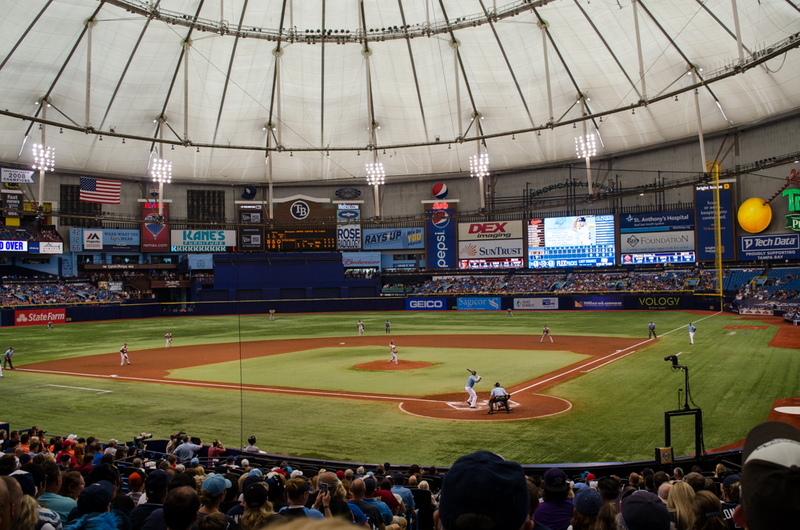 I was able to cross this stadium in Tampa, FL off my list while I was in the area for a girls weekend with my blogging buddy Jenna (from A Savory Feast). 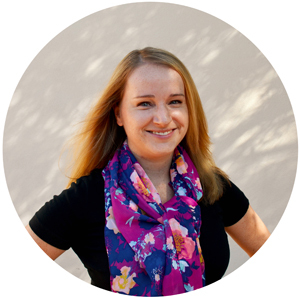 Stay tuned for a post with more info about fun things to do in the Tampa area! 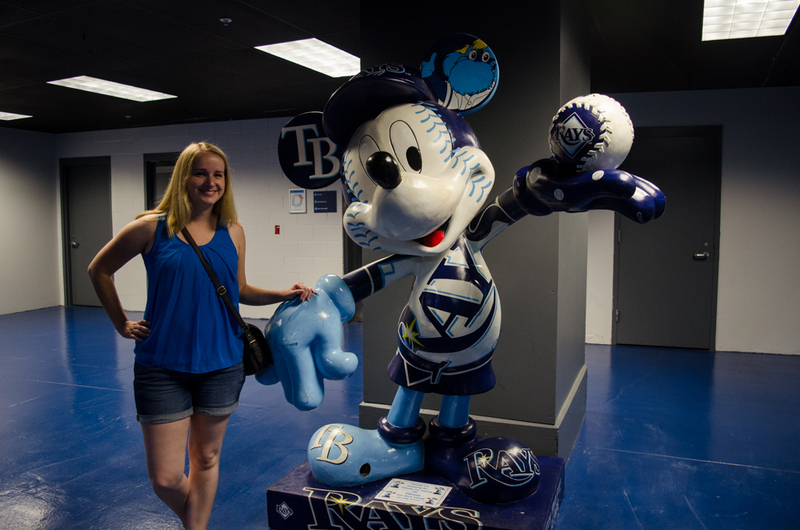 For anyone new around the blog: I’ve set a goal of visiting every MLB stadium and now have 17 of the 30 stadiums done. 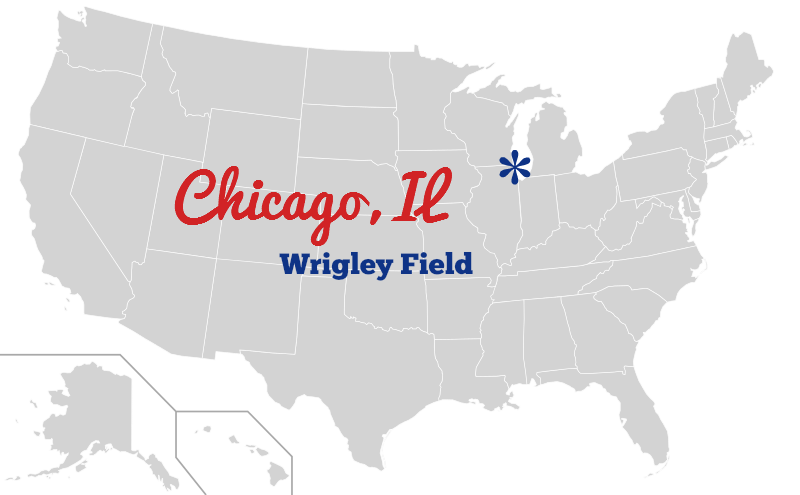 To find out what other stadiums I’ve visited check out my MLB Stadiums page. 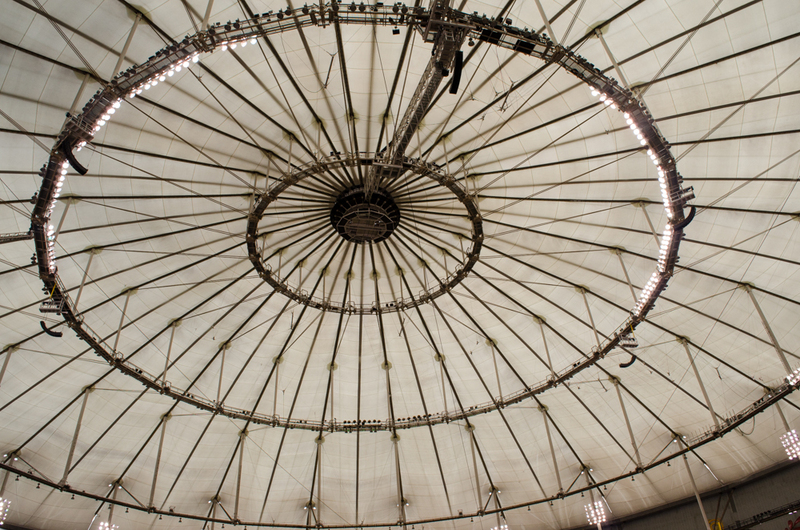 The most notable thing about Tropicana Field, or “The Trop” as they refer to it, is that not only is it one of the few stadiums with a roof; it’s the only one with a roof that doesn’t open. I was a bit skeptical going in about what it would feel like inside but it was surprised by how bright it felt inside. It has a weird way of making you feel like you’re in natural light. The grass looked normal and the field felt very modern. I also loved where we were sitting (see picture above) and they’re some of the best seats I’ve ever had for a professional baseball game. From what I could tell all of the seats in Tropicana had a good view – but I was especially happy with our view! Every stadium has it’s own thing that makes it unique. In Phoenix we have a pool in the outfield. 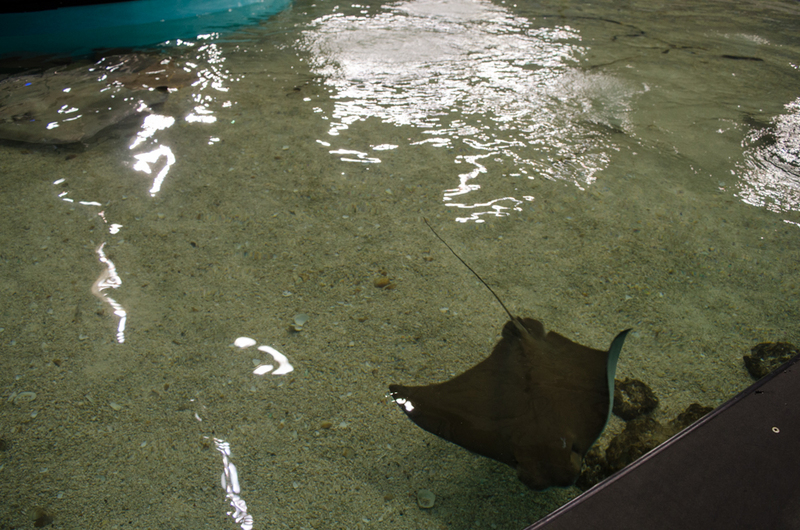 In Tropicana Field they have a sting ray tank. 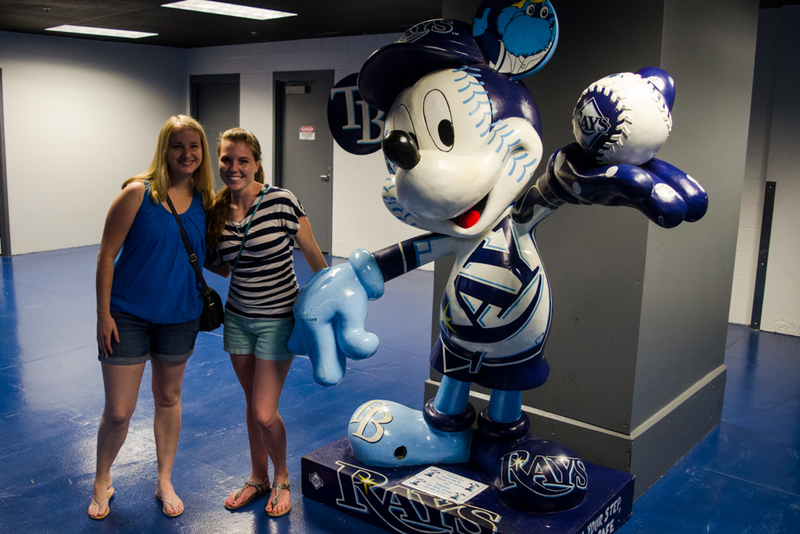 Of the 17 MLB stadiums I’ve visited thus far I’d rank this special feature as one of the best. Not only is it extremely unique it’s also a really fun activity for kids (and me) to be able to enjoy. We had to wait in line for about 20 minutes before we got to go in and they send people up in groups. 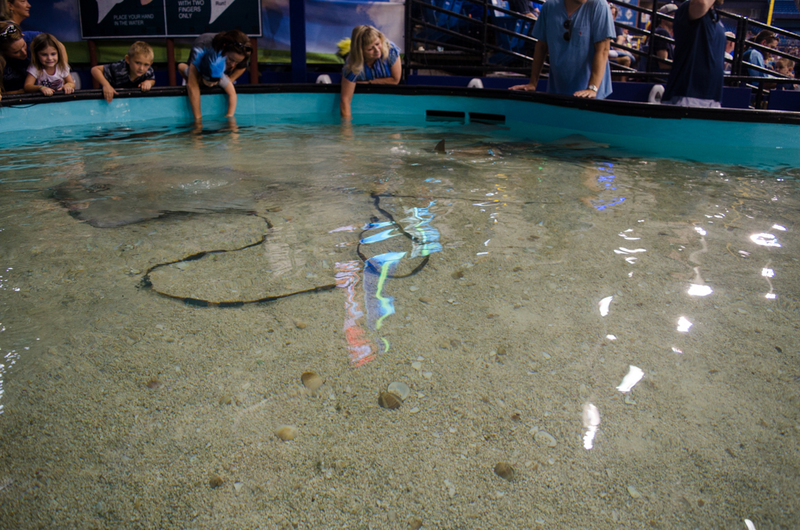 They give each group eight minutes with the sting rays and you have plenty of chances to touch them. 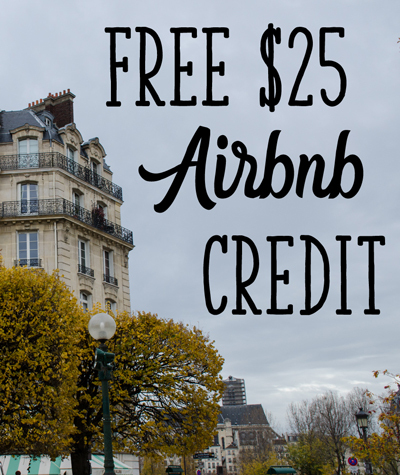 For $5 you can also feed them. 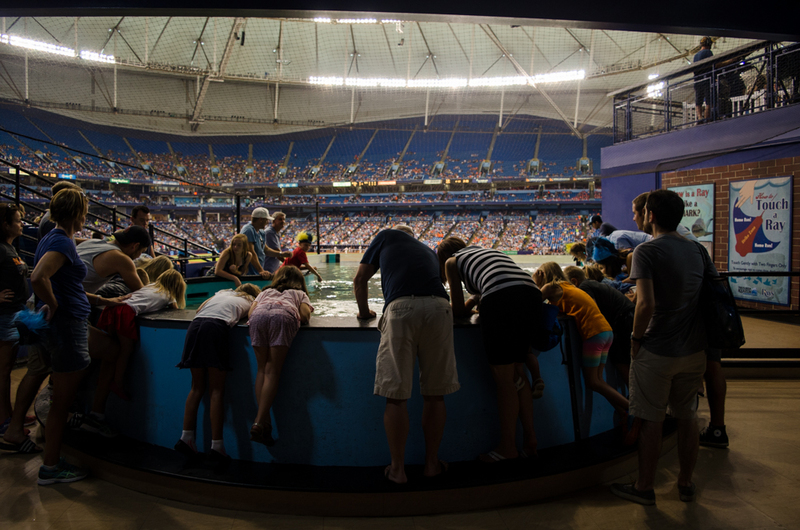 I recommend a visit to the Ray’s Touch Tank to young and old alike. 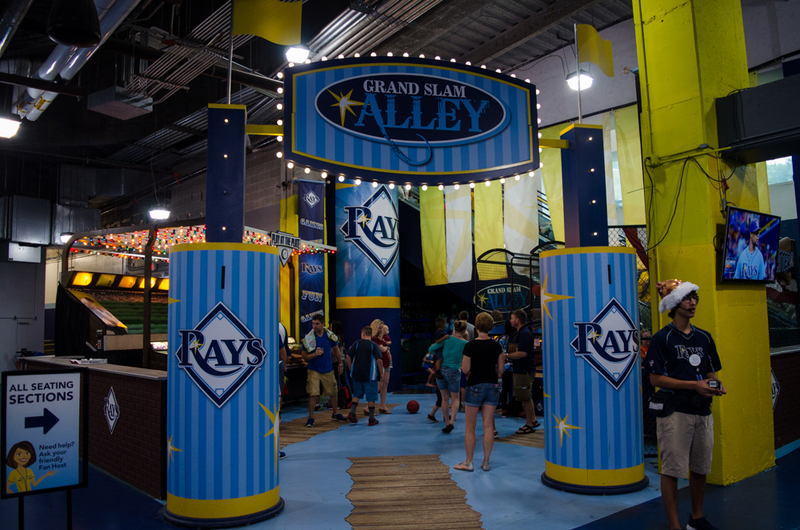 They also have an arcade and some other areas for kids to explore but beyond that it’s a pretty standard baseball stadium. 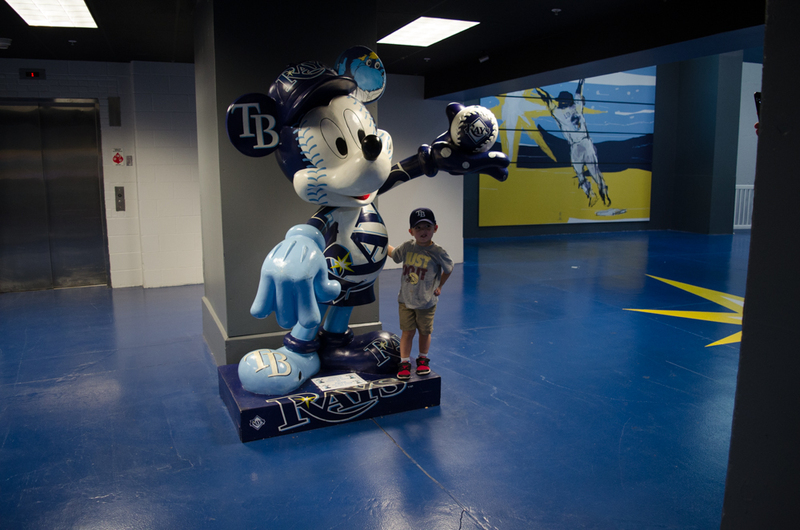 The other notable attraction within the stadium is the Hitters Hall-of-Fame which is worth visiting if you’re a baseball fan. I didn’t see any food items that seemed distinctly Florida or unique about this stadium. They pretty much had the classic baseball fare. You could of course order a Tropicana orange juice if you wanted to. 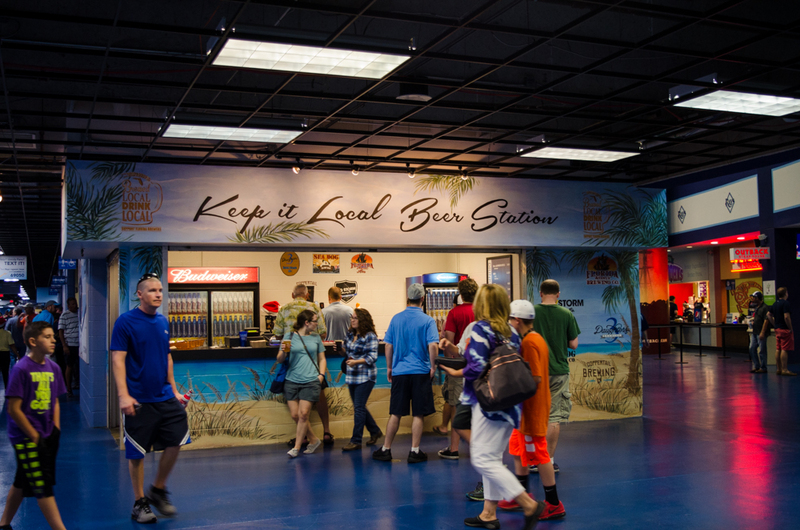 I did notice that they had a beer stand that was devoted to local brews which I thought was nice. If you’re looking for a good place to grab some food before or after the baseball game I highly recommend Engine No 9 – a great burger place right by the stadium. Tropicana Field also has its own parking lot so for $20 you can park in the official parking lot by the stadium. There are numerous cheaper options around the stadium as well. And of course like all stadiums they always have various places that make for a good photo op. 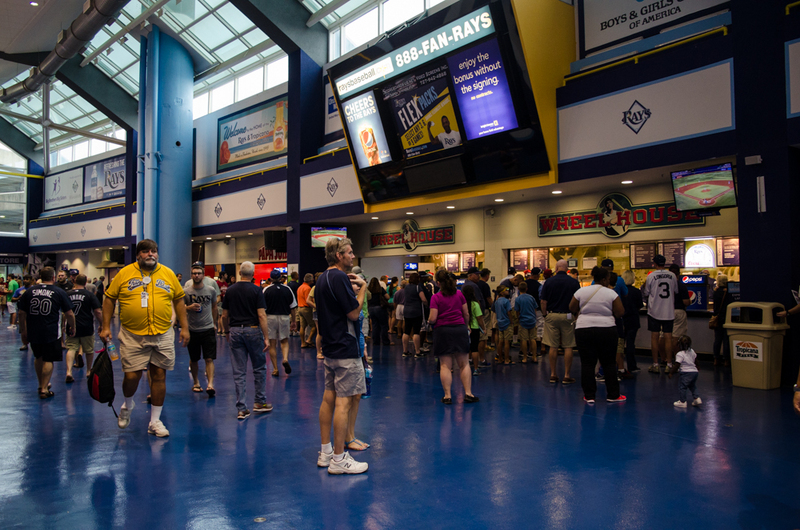 I was pleasantly surprised to find that the Rays seem to have quite a few loyal fans despite the fact that I’d heard that they are one of the least attended teams in MLB. From what I can tell there are a lot of logistical issues with the location of the stadium (it’s technically in St Pete not Tampa itself and the drive isn’t convenient) which adds to the attendance problem but the team has been performing really well the last few years. And despite the stadium being an older one (there’s been lots of talk of getting a new stadium) I felt like it manages to still feel modern. It definitely lacks the classic baseball feel of Fenway or Wrigley but to me it was still distinctly baseball. 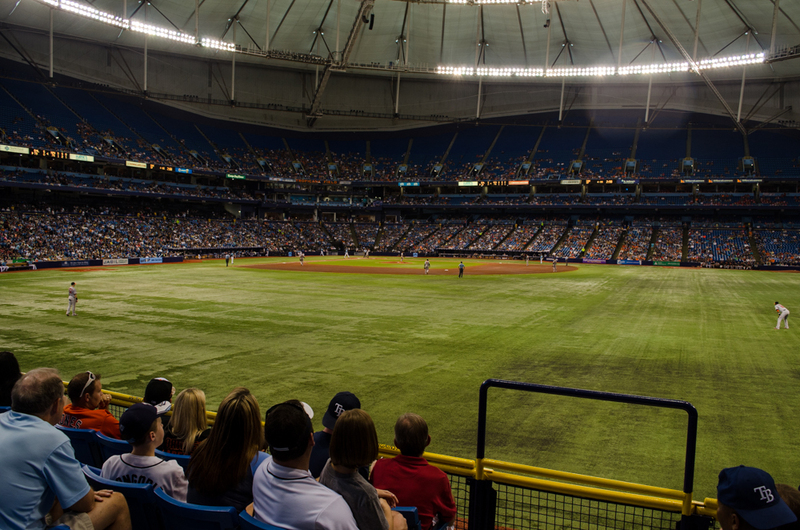 And at the end of the day I really like Tropicana Field! Given the chance I’d be more than happy to visit again. 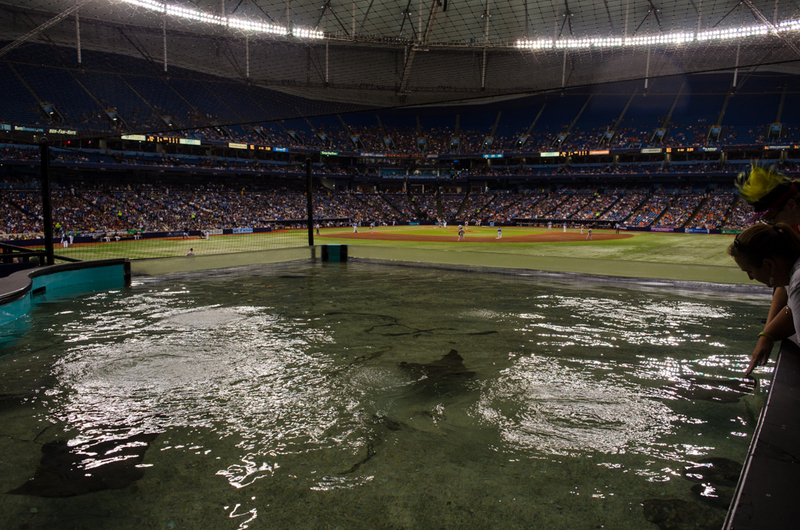 Huge thanks to the Rays for the free tickets. As usual all opinions are my own. This was so much fun! I’m glad we got to check off another MLB Stadium for you. This one definitely is unique! And I second the Engine No.9 for pre-game food! I would definitely recommend eating lunch or dinner there first and then just getting snacks or drinks at the game. It’s soooo good. I want to go to this stadium. If you ever want to go to PNC let me know. I still have a lot more on my list for MLB stadiums. 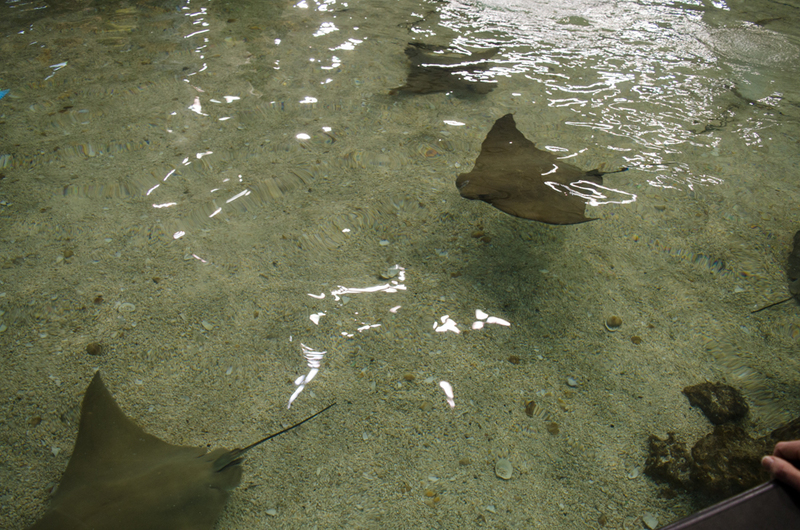 The Phx zoo has a sting ray area that you can feed them too. That’s such a fun idea to try to visit all of the stadiums! I’m not really into baseball, but I would love to do something similar for something I am passionate about. 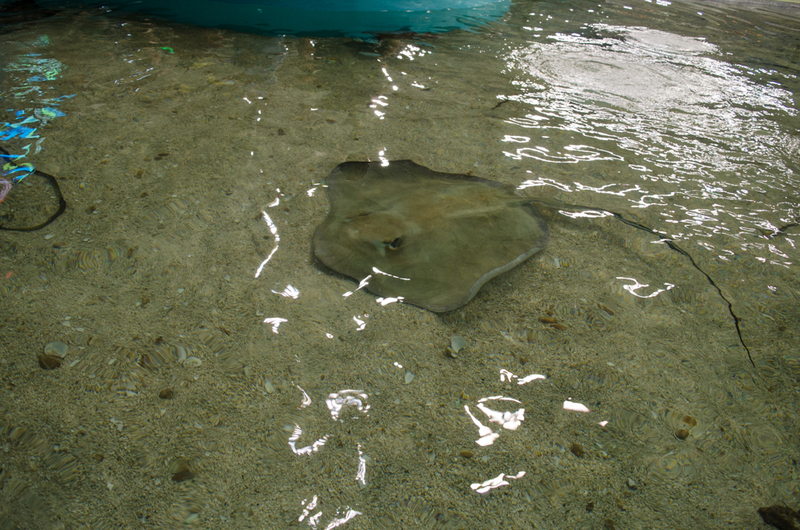 I love the idea of a sting ray tank at a baseball stadium though! If you ever make it to Minneapolis for a game at Target Field you’ll have to let me know!